R-Type - TurboGrafx-16 - Free Shipping! 5 out of 5 stars - R-Type - TurboGrafx-16 - Free Shipping! 4 product ratings4 product ratings - R-Type - TurboGrafx-16 - Free Shipping! Instruction - B. R Type I 1. Case - ( Slightly faded. inner side yellowing.). Item is complete and basically as photo shown. If you have a US system then yes it should. Condition: used in great condition. 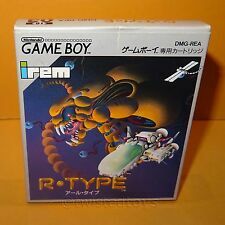 R-Type (Game Boy, 1991) H-SEAM SEALED! - ULTRA RARE! An absolute must own for any serious GB collectors! 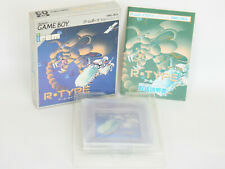 5 out of 5 stars - R-Type (Game Boy, 1991) H-SEAM SEALED! - ULTRA RARE! 3 product ratings3 product ratings - R-Type (Game Boy, 1991) H-SEAM SEALED! - ULTRA RARE! No cracks in the case. I try to find you a product that you would like in Japan. I will do our best to solve your problem. ※With compensation. Software only. None case. Dirty, faded, there a little. If you have a US system then yes it should. Are DVDs region 1 and authentic?. Yes, all DVDs are region 1 (US) and authentic (no fakes or knockoffs). R-Type (TurboGrafx-16 Turbo Grafx). Tested and works great. It presents signs of use like scratches but it's in very good condition. Super R Type. Ugly Creatures That Advances The Cave That Crowded. Very convenient place to find item information about Japan. We are located in Japan a suburban city of kyoto. Our Products are 100% Authentic. Consisting of condition considering its age with slight wear, creases and edge wear as shown. Consisting of back as shown. The front label is printed with '1991 IREM 'Made in Japan'. Good physical and working condition. Formato JAP. We will respond as quickly as possible.